Company Name: Jiangmen Xingjiang Steering Gear Co., Ltd.
Design and Manufacture: Power steering gear (re-circulating ball), Electronically controlled hydraulic power steering, Electric power steering, pitman arm, bevel box. Product Applications: Light, medium and heavy trucks, Buses and coaches, Crane and special-purpose Vehicles, Passenger cars. Major Customers: Seven out of the top ten heavy truck manufacturers in China are using GX steering gear. 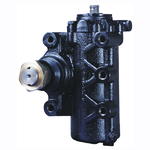 Seven out of top ten bus and coach manufacturers are also working with GX steering gear. Production Capacity: 350,000 units a year (2012), 500,000 units a year (2016). Staff: 38 engineers, more than 80 technicians and 500 workers (2012).